The Dr. Seuss classic How the Grinch Stole Christmas returns to Blu-ray offering the complete Grinch package with two additional remastered TV specials featuring the green grump making this a must-have for completists. Those looking for a new transfer and new bonus features for the original Christmas special will certainly have to wait as this release is a carbon copy of previous HD releases. Warner Brothers’ Ultimate Edition Blu-ray arrives with a respectable A/V presentation and enough bonus features to please any fans of the Grinch. Recommended for Fans. Not a day goes by that I don’t read a Dr. Seuss book to my kids. Whether it’s Mr. Brown Can Moo! Can You? or my personal favorite Hop on Pop - they are enamored with the linguistic gymnastics needed to get through the books. Now that I’ve amassed a veritable library of Dr. Seuss classics it’s hard to not think of how most of us were introduced his work. 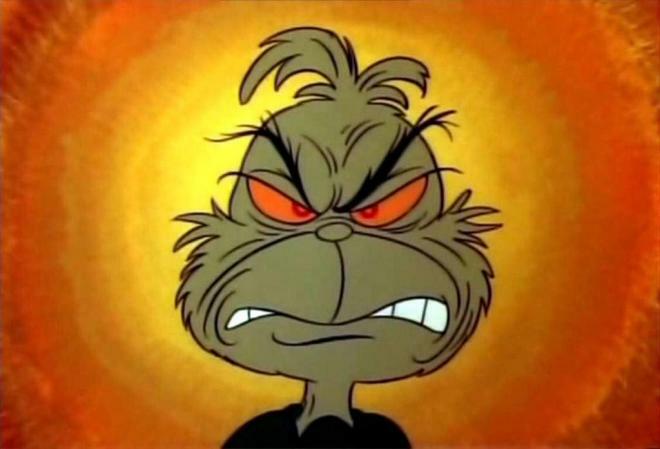 How the Grinch Stole Christmas was, like most kids of the 80s, a holiday TV staple that introduced us to the green grump who hated the most wonderful time of year. Unbeknownst to me there were two other TV specials featuring the Grinch that make their HD debut on this collection. But seriously, can anything really top How the Grinch Stole Christmas? The Grinch hates Christmas. Looking down on the colorful town of Whoville from his cave high in the mountains, the villainous green grump watches as the residents joyfully celebrate the holiday. As they join hands in the town square to embrace goodwill and Christmas cheer, their collective energies bring forth a warming glow nearly as bright as their holiday decor. Our narrator (Boris Karloff) informs us, “Then he got an idea. An awful idea. 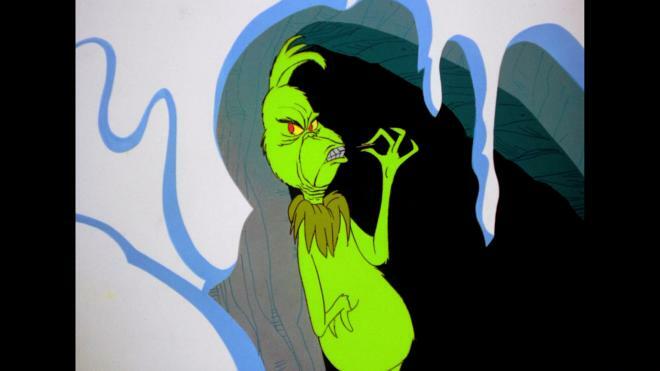 The Grinch got a wonderful, awful idea.” The diabolical plan was naturally to steal Christmas from Whoville! Setting himself to work sewing a “Santy Clause” costume, he also builds a sleigh to be pulled by his unwilling dog, Max. Under the cover of darkness, he glides into town to steal every piece of Christmas from the Whos in Whoville. Unfortunately, it didn’t occur to the Grinch that the residents of Whoville weren’t just celebrating packages and trees, but rather a season of joy. Co-directed by animation legends Chuck Jones and Ben Washam, How the Grinch Stole Christmas is more than just a wonderfully bizarre adaptation of A Christmas Carol, but an animation masterpiece that still resonates with children and adults today. The follow up special Halloween is Grinch Night came 11 years after the success of the Christmas special. In this story, the residents of Whoville are going about their daily lives when a foreboding wind blows into their hamlet causing quite a stir. Surely announcing the arrival of the Grinch, they bolt their doors and close the shades hoping to survive the wrath of the green grump from the mountaintop. A fearless boy named Euchariah leaves the safety of his house and faces the down the Grinch. As expected for a Seuss special, the animation veers into psychedelic and trippy visualizations that are interesting, but might be a bit too much for little kids. Songs are clever and unique but don’t have the charm of You’re a Mean One, Mr. Grinch. Halloween is Grinch Night succeeds as a faithful attempt to render the Seuss visual language and dialogue into a logical narrative. Though conceived as a prequel to the Christmas special, certain continuity errors make that a confusing idea by the end of the special. 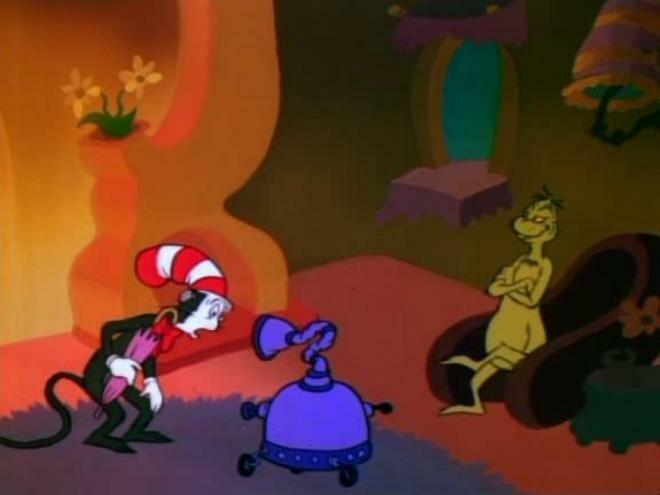 1982’s The Grinch Grinches the Cat in the Hat is the final Grinch special. Pairing up with The Cat in the Hat seemed like a killer idea considering that both characters were hugely successful at the time. The story starts like you’d expect: after a bit of vehicular road rage the Grinch attacks the Cat in the Hat with a darkness ray to which he retaliates with Freudian psychoanalysis landing him in the Grinch Dimension. Got that? There’s so much going on with this animated special I fear only Seuss devotees could only appreciate it. The redeeming qualities are couched in too much psychedelic silliness to make it an endearing experience for adults and children alike. The collaboration between Chuck Jones and Theodore Geisel culminated in one of the best animated tv specials ever created. With How the Grinch Stole Christmas, a character entered the Christmas holiday culture and never left the media landscape. Even today a new Grinch film is about to hit theatres! The Grinch specials that followed were an honest attempt to broaden the narrative of the green grump while maintaining the qualities that make for a surrealistic Seuss tale. Unfortunately, lightning doesn’t strike twice. 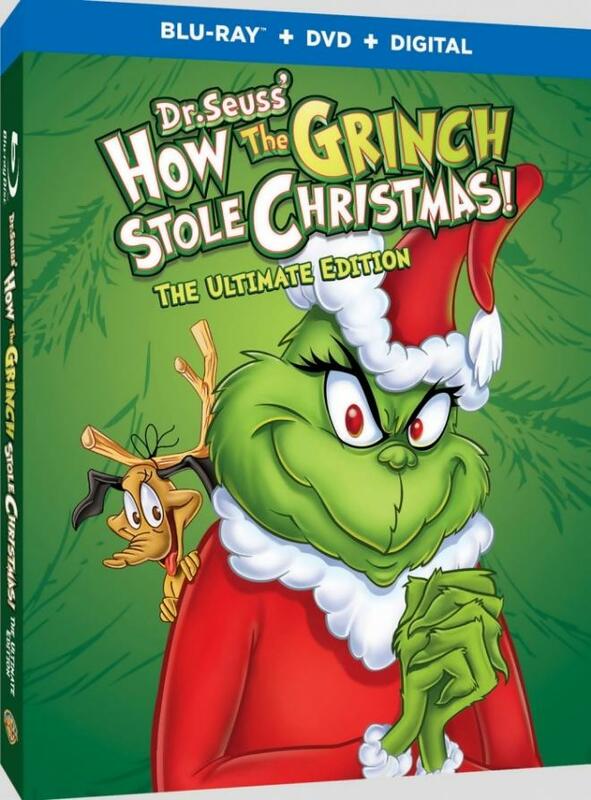 How the Grinch Stole Christmas returns to Blu-ray in an Ultimate Edition from Warner Brothers. This Blu-ray/DVD Combo pack includes a Movies Anywhere Digital Copy code all packaged in standard keepcase with disc trays on each side of the opened case. The disc loads the WB logo before landing on a static menu screen with the film’s memorable song, “You’re a Mean One, Mr. Grinch” looping. Typical navigation options are available. How the Grinch Stole Christmas, Halloween is Grinch Night, and The Grinch Grinches the Cat in the Hat all arrive on the Ultimate Edition Blu-ray from Warner Brothers in an MPEG-4 AVC encoded 1080p transfer in the 1.33:1 original aspect ratio. Transfer looks bright and vivid with primaries loud and bold with excellent contrast. Chuck Jones’ art still rings true with solid lines and deep color fills adding a vibrance to every animation cell. Noise is evident throughout the feature in background elements. This is especially noticeable when the ornament falls from Cindy’s tree as the Grinch is stealing it. Black levels are solid and inky throughout the feature. Even with all these defects and anomalies, the Christmas classic retains the 60’s animation patina. However, I think most fans were awaiting a 4k restoration of this feature. This set benefits from being bundled with the other Grinch features, but sadly those looking for a 4k restoration print of this will certainly have to wait till yet another Grinch adaptation hits theatres in about 10 years or so. Halloween is Grinch Night presents a transfer with bright primaries, strong contrast and dark inky black levels. The Grinch appears more muddy green than bright green. After seeing these three features I’m not certain which is the true Grinch color anymore. Thankfully, Max the dog holds true with each story in a warm light brown that skews pink at times. Pastels play a much greater role in the color palette this time around. It looks like a primer for 70’s cartoon color schemes. Watching this back-to-back with the Chuck Jones original you get a real sense of how much the animation style affects your perception of the characters and story. The Grinch Grinches the Cat in the Hat presents a washed out image with muted colors. The Grinch looks more brown/chartreuse than green. Contrast on the Grinch scenes is lackluster. The Cat in the Hat gets a better visual representation on this transfer with bright primaries and solid black levels. Over-saturation is evident at times giving the same appearance as when my 4 year old applies 11 layers of paint to an art project. Dirt and specs are present throughout the feature. A passable DD 2.0 mono track with noticeable hiss and muffled dialogue issues. Music presence is inconsistent within the sound mix which gives the impression of a worn out VHS. I expected a cleaner representation of the dialogue and music tracks but came away a bit disappointed at needing to adjust the volume at every turn. Boris Karloff’s iconic narration sounds brassy at medium volume levels so keep that remote handy to negotiate balance. Purists will no doubt relish the audio quality, but those looking for a restored audio experience from The Grinch will certainly have to wait. The DD 2.0 mono track on Halloween is Grinch Night is clear with plenty of room for the loud boisterous musical numbers and silly narration. While hiss and distortion aren’t pronounced, the audio track sounds muffled at times. The Grinch Grinches the Cat in the Hat offers a DD 2.0 mono track that is clear and crisp with little hiss or distortion evident. Dialogue is loud and very clear even if you don’t understand a single word The Cat is spouting. Effects are balanced well in the mix allowing for just enough room for music cues. Sync issues appear at times and are quite obvious. 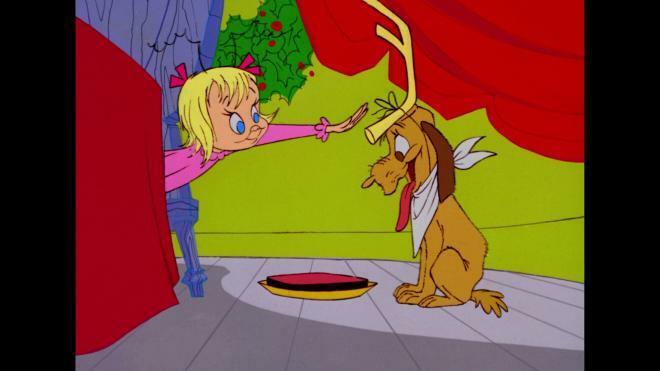 Audio Commentary: Animator Phil Roman and June Foray, the voice of Cindy Lou-Who, offer a casual commentary full of anecdotes from the production and the legacy of the holiday TV special. Dr. Seuss and the Grinch: From Whoville to Hollywood (HD 15:48): A dated studio EPK featurette that explores Dr. Seuss’ life, inspirations, and original artwork for the TV special. Songs in the key of Grinch (HD 8:01) Interviews with composer Albert Hague and vocalist Thurl Ravenscroft aka: “Tony the Tiger”. Who’s Who in Whoville: Text biographies for June Foray, Boris Karloff, Chuck Jones, and Dr. Seuss. Grinch Song Selections: Watch four different musical selections from the Christmas special: "Opening Song", "Trim Up the Tree", "Welcome Christmas", and "You're a Mean One Mr. Grinch." TNT’s How the Grinch Stole Christmas (HD 19:18) A 1994 TNT special hosted by an in-character Phil Hartman that looks at the legacy of the holiday special and features an interesting interview with Chuck Jones. Fans of Hartman’s impressions and comedic styling will certainly enjoy this as well. Grinch Pencil Test: 3 storyboards from the TV special. How the Grinch Stole Christmas is a timeless holiday classic that can reach audiences whether they’re 1 or 101. In an era of countless TV shows and holiday specials available at your fingertips don’t forget about the ones that paved the way! With this new Blu-ray set audiences will get a chance to add some Grinch to their Halloween celebrations, too. These two additional Grinch features are enjoyable but don’t have the permanence of the original cartoon. Warner Brothers’ Ultimate Edition Blu-ray for Dr. Seuss’ How the Grinch Stole Christmas carries over a passable A/V presentation and special features from previous releases. If you’re looking to get your first copy of the Grinch or get the additional specials you should definitely pick up this release. Recommended for Fans.